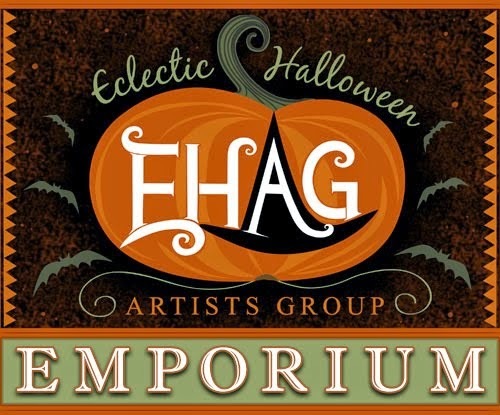 Happy Holidays: The EHAG Emporium is open. I am so glad that you stopped by to have a look at my sculpture - “Landscape rattle, Ambrose and Monty, his Parade Lantern”. Ambrose and Monty, his parade lantern, are discussing the coming events for the evening. Well, I suppose I will tell you about the making of this sculpture, what you can see as well as what you cannot see. The barrel rattle that the landscape rests on is 5 1/4" wide and the ground that was built up with tinted composition is roughly 2" wide. The cardboard cylinder was covered in crushed, hand painted paper before adding the composition ground. Inside the cylinder is a ½” wide x 2 ¼” high x 5” long piece of wood filling the centre of the interior, it has been glued in place. Holes were drilled through the cardboard cylinder into the wood to hold the fence, the tree, and the handle securely place. Cardboard, painted black, covers each end of the rattle. Screw eyes were inserted in the centre of each end to hold the vintage brass bells. It was then covered with black glass glitter. Glue was painted over the glitter to hold it in place when the bells move across the surface. 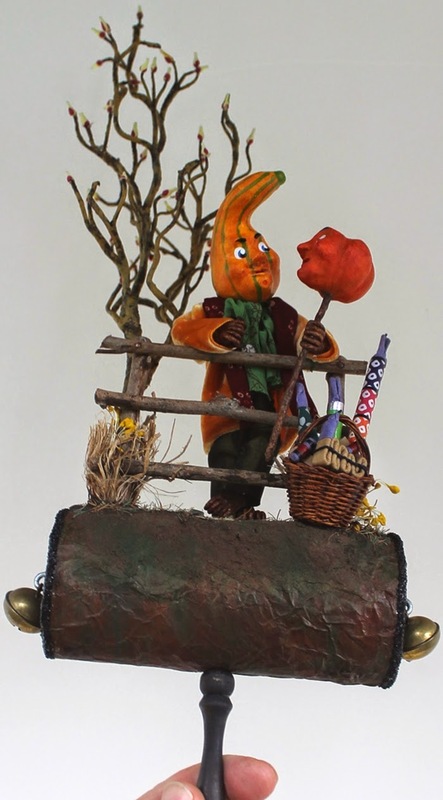 The 10 3/4" tall tree was hand built from vintage florist pips, tissue paper, wire, and painted with acrylic paint. The wooden fence was made from branches from a vintage basket; nailed together with cigar box nails. The basket with the miniature handmade fireworks was first aged, distressed with paint, and then screwed in place. I do not want anything to come unglued so I take many precautions such as this when building my sculptures. This back view shows the orange velvet coat that Ambrose is wearing. It was made from a piece of vintage orange velvet ribbon. The collar of the coat comes from a piece of a vintage scarf. Ambrose stands 5 3/4" tall. The grey green composition that was used to make the ground that Ambrose is standing on was painted with acrylic paint. Once dry glue was liberally applied to the ground and a mixture of roasted sterilized soil, finely cut hand dyed green, brown, and natural sisal twine was dusted onto the glue. The tree has been glued into a hole drilled into the rattle. The trunk has also been nailed to the fence and also wired to the fence for security. Sections of vintage vegetal fibre rope were glued around the base of the tree interspersed with vintage yellow floral stamens to resemble weeds. More weeds and dried grass were added to the base of the other fence post. This view shows a bit of my hand so that you can get an idea of the scale of the sculpture. The overall size of the sculpture is18” high, 6 ¾” wide from bell to bell, and approximately 4 ½” deep. 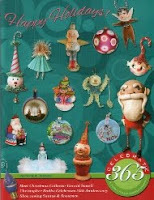 $250.00 plus $35.00 postage. This sculpture arrives duty free into the US. When I pack this sculpture it will be carefully wrapped, the tree bent over onto the sculpture so as not to require a larger box and much more postage. The tree can be carefully bent back into shape without damaging it. Please email me at lenbenny@shaw.ca if you wish any more information or to purchase this sculpture. I take PayPal and can also take credit cards through PayPal. I do not take personal cheques.